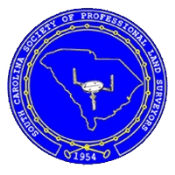 The South Carolina Society of Professional Land Surveyors (SCSPLS) was formed to advance the public welfare and the professional, social and economic interests of the Land Surveyor by promotion of education, legislation and public relations through the establishment and maintenance of high ethical standards and practices. It is proposed to bring about coordination between the Land Surveying and Engineering Professions through close cooperation with representative organizations of Professional Engineers. Click here to visit the SCSPLS website.